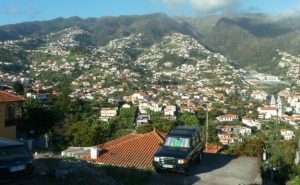 Apart from art, I love to travel and after a summer that was decidedly cool, we took advantage of the opportunity to get away in November and gave Madeira a go with it’s subtropical scenery and warm climate. 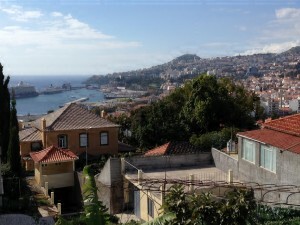 The landing was pretty steep and as we soon found out so was the terrain but a massive new roadwork project around the island means the 15 km to Funchal took us 15 minutes, which 15 years ago took over an hour. We stayed in the very apt ‘Painters Cottage’, owned by Cristina who lived in a beautiful typical Madeiran mansion. 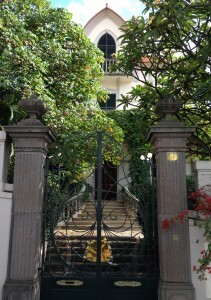 in western Funchal, where the first settlers arrived and following Portuguese built some of their most beautiful homes. More residential with stunning views and away from the metropolis of the high rise hotels and busy roads, it felt very local with stunning views over the whole of the city, harbour and sea. Our local shop (up the hill) sold great local fruit and veg with sides of beef hanging up in the see through fridge. It hasn’t changed for years and doesn’t need to. The pastelaria, bakery next door cooked bread from six to 10pm. 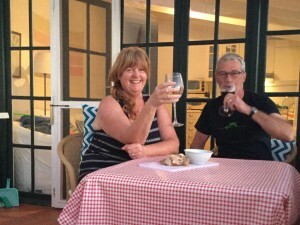 Self catering the way to go for us and seriously cheap. I certainly gets you fitter. We walked miles and often up quite steep endless inclines. It is very hilly outside the town centre and you would need to be a very confident driver to cope with the steep narrow roads here, but the buses were great as were the taxis. They travel fast and take a more rural route; think rollercoaster! 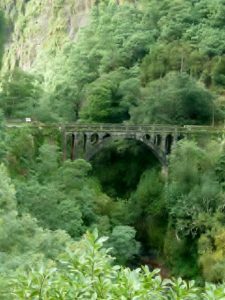 but affords amazing views into how the locals live and the stunning valleys where bananas are planted in any piece of unused land. 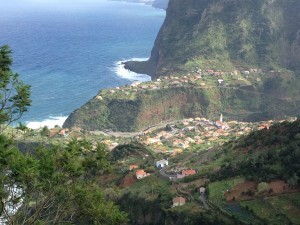 We can also recommend a jeep safari to see the real Madeira. Stunning but slightly hair raising and keep your head for heights. Madeira has a reputation for attracting the ‘oldies’ and I think this is still the case, especially in the winter months. It was very evident that we were amongst the youngest of the current visitors. After feeling our feet, we quickly sought out a local hip bar at the end of the old town, It’s always worth just going a bit further around the corner to see what you can find, and we found a lovely tree lined courtyard above the sea with great cocktails, beer and outside dj’s and live music . We’d struck gold! 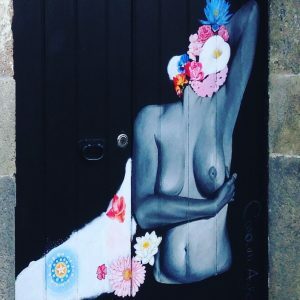 There are snazzy shop fronts in the main town and the promenade is wide and stunning to walk, but the edge of the old town has a string of art painted doors and small cobbled roads which are filled with character. 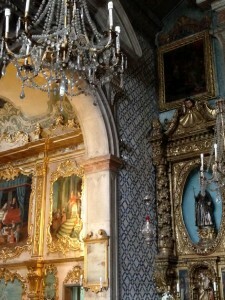 And definately go inside the churches.. I’ve never seen such ornate and detailed decoration. In November, you seriously can get four seasons in one day on the island, but Funchal bay is unique as it maintains a sunny aspect so we based ourselves in this lovely town and did trips out to the Curral das Freiras (valley of the nuns), Camares dos Lobos and to Calheta where the stunning Mudas contemporary art gallery is now situated. Not to be missed for art lovers, the location is mind blowing with a great variety of quality modern art. So what’s good…. 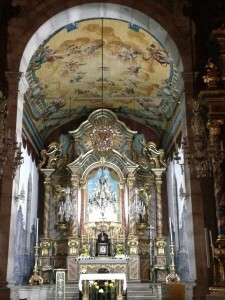 The coffee, cafes, the weather, the blue skies, the scenery , the hair raising rides, the levada walking (but suggest guided where possible) and the interiors of the stunning ornate churches. The youngsters are friendly and most helpful . Shop at the collegio Jesuits, the university gift shop with the best gifts where all the profits go to support and provide bursaries for islanders. There is a massive choice of fruit and several varieties passionfruit exist with pineapple bananas (yes, in one fruit ), the custard Apple (just that) and the millions of small intense perfumed bananas grown all over the island. The wine is good and cheap and you have to try traditional poncha, a mix of fresh lemon, sugar cane rum from the island mixed with honey, and Nikita, pineapple bits, white wine and ice cream. Pop into Reids hotel for a look around, but don’t buy any drinks or food. Seriously expensive! What’s not so good… The food is ok in general ,but we weren’t blown away by anything apart from fruit, pastries and ice cream.. oh and limpets! No beaches a definite downside for us especially as it was a lot warmer than we expected. A two hour ferry ride to Porto Santo with fantastic beaches was a possibility but in Nov out of season. 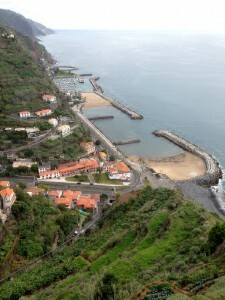 Top tip is to base yourselves in Funchal as most other towns felt remote, lacklustre and some decidedly tired. Funchal is where the money has been spent. Would we go back… Yes probably , but not for a year or two. 😉. 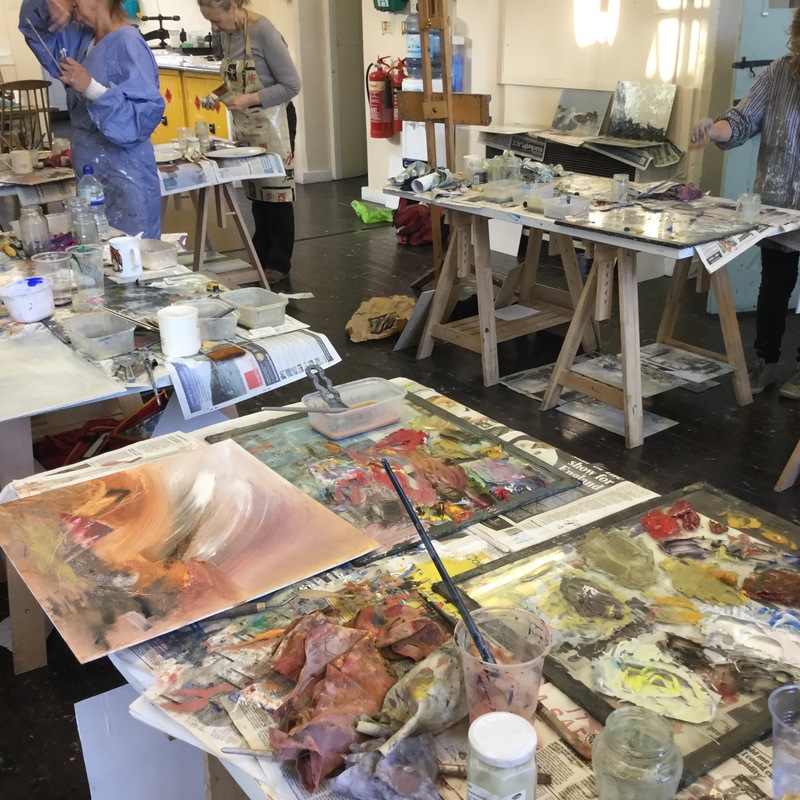 A weekend away at Newlyn Art School always motivates and gets the inspiration going, but will I make the switch to Oils? A two day course in Oil and Abstraction with Gareth Edwards certainly lent me towards giving this medium a go, but it’s a pretty big investment in time and money. 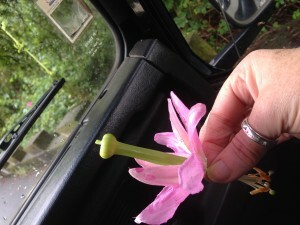 They smell lovely, they feel lovely; I had no idea how adaptable they were and I love breaking rules. But they are incredibly messy and take an age to dry. Working st home this was really a no no, but now I have a studio space it’s the ideal opportunity to unleash a new passion , but need to balance whether I have the patience and care for that to happen. It would be a new challenge as I work pretty immediately and like quick results, but I’m thinking a slowing down of the process might allow more depth and creative thinking into a piece of work. Of course it is possible to produce work in one session, ‘Alla Prima’ , wet in wet and this is what we did over the two day workshop, but it requires a skill in not producing ‘Mud’ but colours which can resemble ‘mud’ are apparently interesting neutrals and I am beginning to see their worth as other colours put alongside absolutely ‘Sing’. I have used water based oils in the past and thought they were ok, but can now see why I haven’t developed a passion for them and have tended to use acrylics instead. They feel really dry and they don’t smell. A few years ago the thought of working in a room of ten people all using turps and linseed was enough to get me running in the other direction, but I was absolutely seduced by it, or maybe ‘high’ on it! There were indeed a few times when we all had to escape to get some fresh air. Commissions are a great challenge, especially when you know the client just loves what you do and trusts in your work. There’s less pressure and more sense of what is important to convey in the painting. This was one such case. Money left by a grandmother and a decision to buy a piece of art. 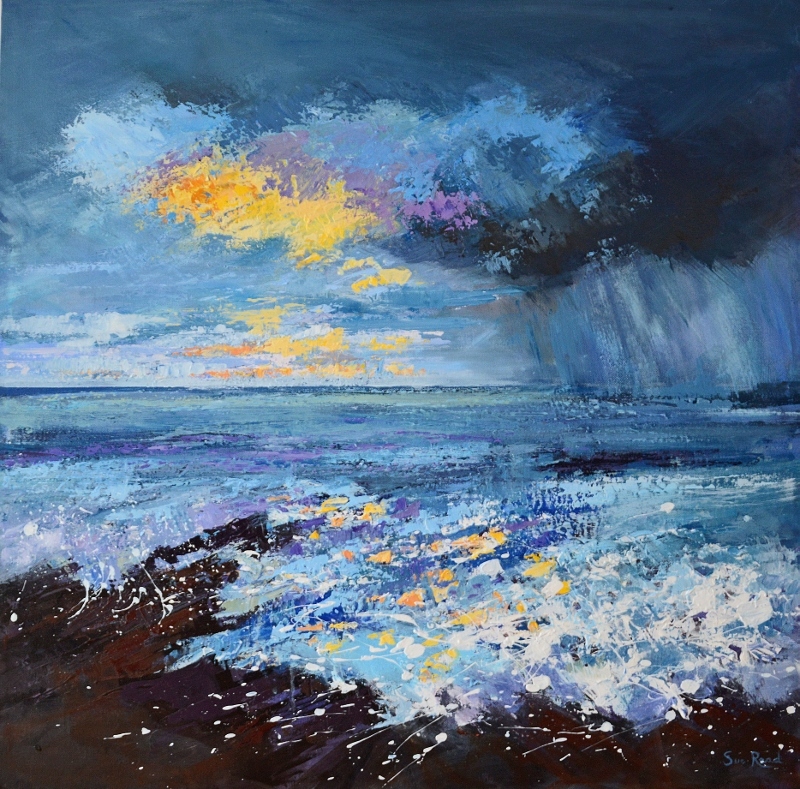 A young lady came to me with such a proposal and connected straight away with a small oil I’d painted on board called ‘ Sunshine and Showers’ but wanted something bigger. The idea of the two weathers, a metaphor on life and the connection she had with this person a defining decision. With BAAMFEST and my own solo exhibition, work didn’t start on it until August. With butterflies in the stomach, the first paint went on. I soon realised it was not going to be a case of a straightforward copy and experimented with underpainting and blending colours in oil and acrylic. On a small scale, the subtleties of blending and soft areas worked well but didn’t translate into a larger piece, so the palette knife and shapers came out replacing most of the brushes and with it stronger colours and more contrast with impasto and a good use of acrylic mediums to get the right texture and finish. I used Golden acrylic mediums and paints and have a great feel for how they work and some of the colour mixes. Bolder strokes with greater depth of colour and lighter areas that bounced forward, it was a good exercise in composition and making the painting work. It took several weeks of coming back to it, knowing it wasn’t working and then redefining areas so that it all came together. 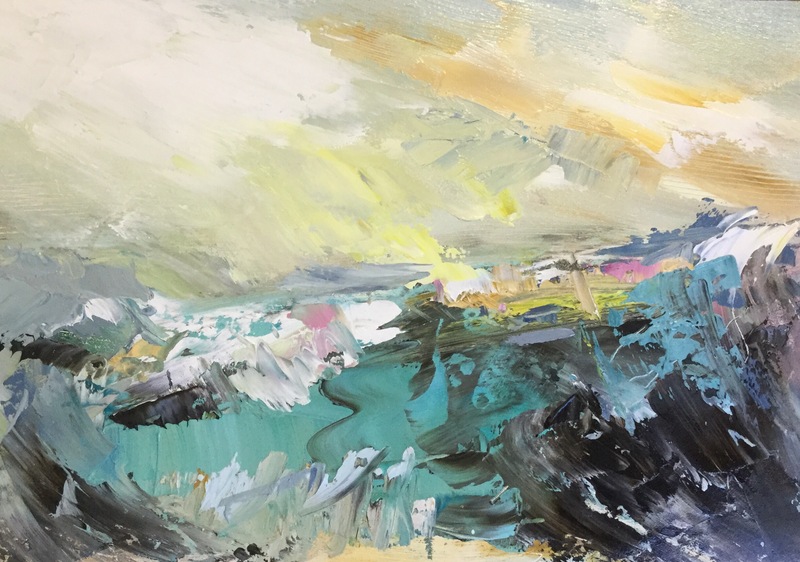 The sky and getting the two atmospheres in one piece became more about expression and painting than reality, and once I realised this, it started to pull together as the yellows, mauves and blues started to work their magic sitting next to each other. On the day of delivery, I was concerned that it was a little too far from the original,but was happy with it myself and thankfully so was she. I recently went back to get a photograph of it, to get a good image and it immediately rang true the instant I looked at it. On a contemporary deep canvas measuring 80cm square it makes a great impact on the room. What a lovely way to remember someone and for them to always be there with you. 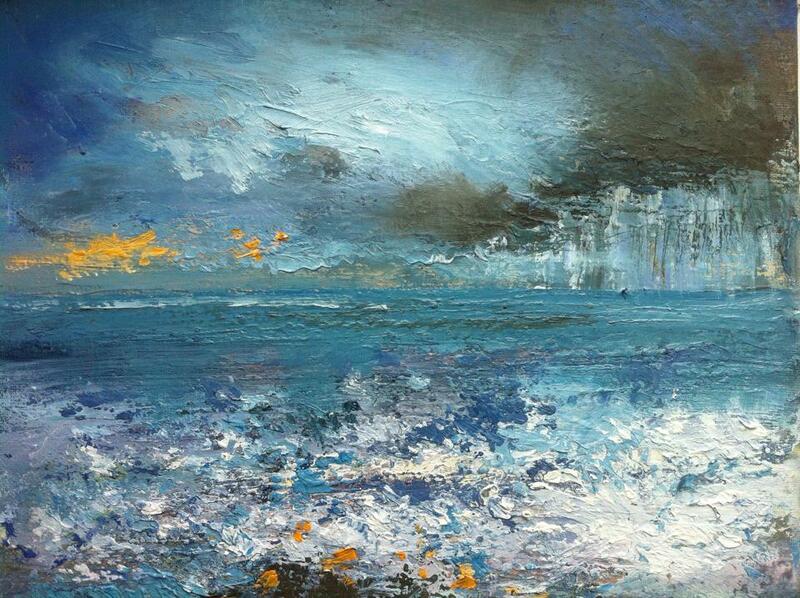 sunshine and showers small oil on board. Cruel and curious a major part of my artistic journey. Cruel and Curious, the concept and vision of Cai Waggett of Hickory Nines, and lucky for me just up the road has just had it’s third show, ‘Hinterland’. Held in the barns at Stowe Barton, a medieval farmstead owned by the National Trust adds an instant air of mystery, but it is more about the camaraderie; a band of people that together with the artists have created such a special event that is more about experience and atmosphere than a selling or commercial stage. It’s beauty lies in the undiscovered; the knowledge that there is so much more; and that the depth of creativity is bottomless. The show held over two days at the end of September has had exposure but remains a somewhat elusive event that you have stumbled across and feels very special and almost humbling. The huge walls and lofty barns give shelter from the Atlantic coast; the smell of rum fuelled coffee, music and the magic of film projected onto the old stone walls makes for a laid back unpretentious atmosphere as artists mix with friends, family and make new acquaintances, bringing their own unique take on the theme in individual spaces side by side. On a personal level, the artistic journey with cruel and curious over the past three years has been influencial to say the least. It has been a time of experimentation, fresh materials and endless ideas with enthusiasm that knows no end. 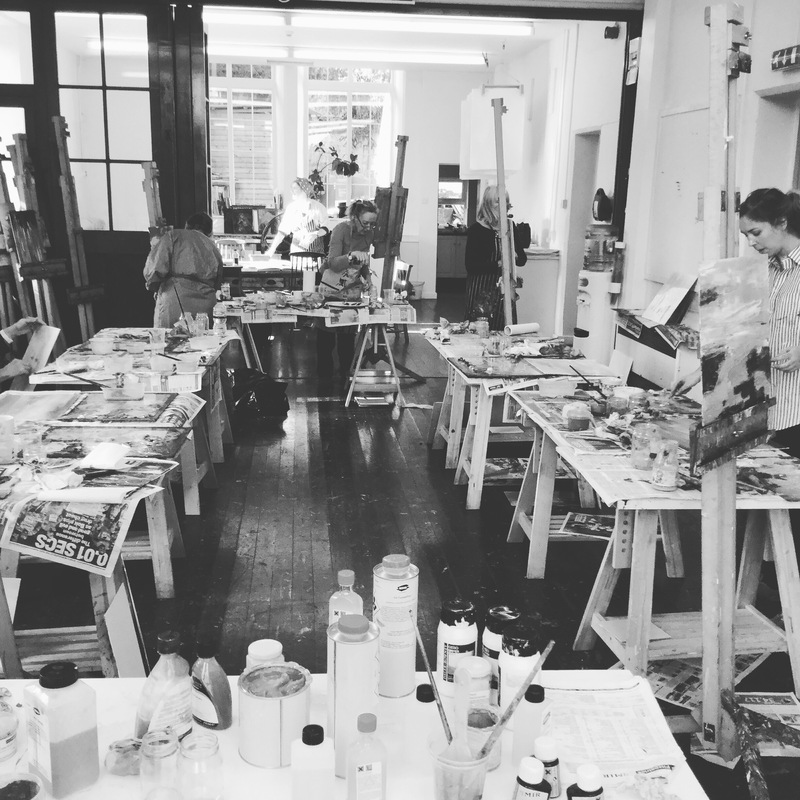 The first year was about finding my feet with a mix of paintings and 3D work using mermaid purses in light boxes. Last year still going with the sea theme, ideas were driven by the huge Altantic storms of the winter which gave me endless pieces of driftwood including broken beach huts and loose pieces of ancient petrified forest that I mixed with resins and painted over. This year the theme of Hinterland, with the valleys, the trees, impressions of the land behind inspired a direction of total contrast and I used aluminium panels to apply paint. The image of a caravan overgrown in a hedge sparked the idea of ‘Home’. Most of my work is focused on the coast. It’s where I’m drawn, always to the sea, but when I go inland I love the pure feeling of nature which feels it still has the upper hand and not us, where people are living in harmony with it. This is their secret to a simple life and they do not always need to find a home in bricks and mortar. The time of day when you feel this harmony most is at sunrise and sunset or dimity as the light fades. The wind stills and your other senses are more heightened as you are aware of smells and sounds and not just sights. Another year done, it is one of the highlights of the year and is a meeting place for some of the area’s more enlightened characters. Next year’s theme is a secret, but lets just say I’m already planning and without wishing to wile time away, can’t wait. It’s nearly time for #CruelandCurious ‘3’. Another great inspiring collaborative exhibition of which I’m proud to be part of .